After four momentous days, a new Crufts Best in Show champion has been crowned as Tease (Ch Collooney Tartan Tease), a Whippet took home the coveted titled tonight (Sunday 11th March). In a packed arena, Tease, who is two and a half year’s old, and owner Yvette Short from Edinburgh, were cheered on as they were chosen by top judge, Jill Peak. The historic moment was captured live on Channel 4, in a programme hosted by Clare Balding, and watched online around the world by millions. Almost 21,000 pedigree dogs from around the world competed at the Birmingham NEC over four days for just seven places in the Crufts 2018 Best in Show final. The other six finalists were, Nana the Newfoundland, Roo the Border Collie, Bopper the Scottish Terrier, Howard the Papillon, Chanel the Akita and Chilli the Pointer. Delighted owner Yvette said of their win: “I can’t believe it yet – it hasn’t sunk in. I’m going to celebrate with my husband David, Tease’s breeder Viv and our friends that are with us tonight. I think Tease will just want to go for a run in the park as usual, though. The Reserve Best in Show award was won by Chilli, the Pointer, owned by Heather Blackburn-Bennett and handled by her mother Joanne Blackburn-Bennett, from Blackpool, Lancashire. 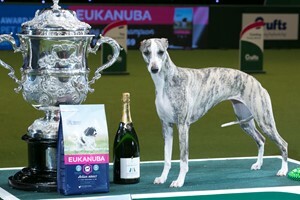 Caroline Kisko, Kennel Club Secretary, said: “What an incredible final, and the end of yet another fantastic show. “Huge congratulations to Tease with her owner Yvette, their success helped end the show on a brilliant high. The pair were very deserving winners and it was clear to see the amazing relationship they had when watching them together in the ring. “Well done to all our fantastic finalists, the dogs and their owners and handlers should be incredibly proud to get through to such a prestigious final – it’s not something many people get to experience in their lifetime.